For filling: In a medium bowl, stir together mascarpone, the 3/4 cup powdered sugar and 1 teaspoon vanilla. In a chilled large mixing bowl, beat whipping cream and 1/4 cup powdered sugar with an electric mixer on medium speed, beating just until soft peaks form. Using a large spatula, gently fold whipped cream into the mascarpone mixture. Arrange one-third of the ladyfingers in the bottom of a 2-quart rectangular baking dish, trimming or cutting to fit, if necessary. Brush ladyfingers evenly with one-third of the coffee syrup or quickly dip ladyfingers, one at a time, into coffee syrup. Spread one-third of the filling evenly over ladyfingers. Sift 2 teaspoons of the cocoa powder over top. Repeat layering with another one-third of the ladyfingers, one-third of the syrup and one-third of filling. Sift 2 teaspoons of the cocoa powder over top. Top with remaining ladyfingers; brush with remaining syrup. Spread the remaining filling evenly over top ladyfinger layer. Cover and chill for 4 to 24 hours. Uncover and sift the remaining 2 teaspoons of the cocoa powder over the top just before serving. NOTE: Dry ladyfingers are known in Italy as "savoiardi." They are sweet, little, fairly dry cookies that are finger-shaped. Look for them at Italian markets and specialty food shops. Some popular Italian brands for ladyfingers are Alessi, Balocco Forno, Bonomi, DeLallo or Roland. For soft ladyfingers, they are sometimes found in refrigerated case, sometimes with cookies and sometimes available in bakeries. 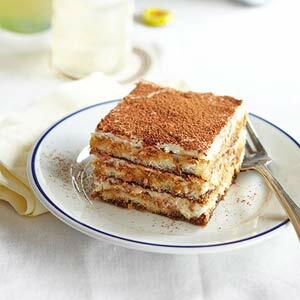 * If using soft ladyfingers, they need to be air dried before using in Tiramisu. Arrange ladyfinger halves in a single layer on a large baking sheet. If you like, cover loosely with paper towels. Allow to stand at room temperature for 24 hours. This is lovely. One change I have to correct: I needed 3 cups of coffee where this calls for 3/4 cup. Not nearly as wet as I like. But then it was awesome!